You did - you haven't lost it - but it just wasn't here. It was on t'other place, "The undiscovered Country, from whose bourn. No Traveller returns". Thanks to all involved for a great show. Thanks to yourself and All Thumbs for kind comments. Glad the layout was appreciated in 'enemy territory', sarf of the river. Interesting loco (type) list! We did do a 'spotters' list when we took the layout to Barrow Hill - perhaps we should resurrect the idea? There's probably others - which 'Y' was the Sentinel Jonathan? A couple of my pix that I managed to take. I was going to say how good the layout was but "Enemy Territory" is a bit strong, looking up from Newhaven we have a view of those up North, Yah and those up t'north, but I'll let you off. Like a previous comment I spent most of my time at the show looking at Grantham, I'd built up a picture of the layout from photos on this forum and from the dark side and seeing it in the flesh did not disappoint. Everyone has their favourite layout perhaps, mine was Biggleswade mainly because it related to what I can just about remember seeing and the period I model, but Grantham pre-dates that by about 25 years, I know that there is Gbeat which is very nice but professionally made, but there is hardly any large layouts like Grantham on the circuit. I found myself trying to figure out which J** loco was a resin wonder and which were whitemetal or brass, I wonder what make that coach is, ah there is a GK modified Hornby on the end, 4 twin set - never seen that before, loved that set of resin hoppers, excellent signalling, I could go on but a really facinating layout. Any negatives, Peco live frog points for exhibitions really need micro-switches but that is probably now too late. You seemed to have a couple of moments with the kadees, but overall how do you get on with using them? Look forward to seeing the layout again. Ooops....the D1 was a typo, I spotted a D2, I also saw a Sentinel parked towards the south of the layout. The J10 was obviously a memory glitch, I wasn't quite sure when I typed it. I should have paid more attention, as it used to say on my school reports, but I probably paid more attention to you fabulous layout than any of my lessons. 60526 wrote: I was going to say how good the layout was but "Enemy Territory" is a bit strong, looking up from Newhaven we have a view of those up North, Yah and those up t'north, but I'll let you off. Like a previous comment I spent most of my time at the show looking at Grantham, I'd built up a picture of the layout from photos on this forum and from the dark side and seeing it in the flesh did not disappoint. Everyone has their favourite layout perhaps, mine was Biggleswade mainly because it related to what I can just about remember seeing and the period I model, but Grantham pre-dates that by about 25 years, I know that there is Gbeat which is very nice but professionally made, but there is hardly any large layouts like Grantham on the circuit. I found myself trying to figure out which J** loco was a resin wonder and which were whitemetal or brass, I wonder what make that coach is, ah there is a GK modified Hornby on the end, 4 twin set - never seen that before, loved that set of resin hoppers, excellent signalling, I could go on but a really facinating layout. Any negatives, Peco live frog points for exhibitions really need micro-switches but that is probably now too late. You seemed to have a couple of moments with the kadees, but overall how do you get on with using them? Look forward to seeing the layout again. 1) Yes, live frogs should ideally have frog switching - and if I didn't work 5-days-a-week and had limitless funds then they would (although Code 100 is a lot more forgiving than handmade track). When I first started building the layout 10 years ago, I made use of what I had available which was new points where I could afford them and 'reasonable nick' second hand ones where I could pick them up. Since then, Peco have upgraded their points and the newer ones (in the see-through packs) are better engineered in several respects. Gone are the virtually useless little tabs beneath the switch blades for example. With much of the mainline track in the foam underlay, whole point replacement is relatively straightforward and I have already done just that which has improved reliability in some areas. When I examined the removed points it was no wonder we were having problems! Frog-switching is not impossible to retro-fit and will be done in one or two further areas where we have persistent offenders. 2) When the Kadees work they are really effective and I quite like the fact that they are pseudo-buckeye if you like. However, they are not (yet) reliable enough on the goods stock and we really need a purge there. Part of the solution is to get the weight of the wagons consistent - I should hastily add that most of the offenders are mine! Big long 'to do' list already for Warley but we'll do our best to attend to reliability improvements in the next two-and-a-half months ahead! Well, after the weekend exertions I'm starting to feel almost human again. Shame you didn't introduce yourselves, it's always nice to put a face to a name, even a pseudonym. I did speak to one chap on the Saturday afternoon who lurks on here and was kind enough to be complimentary - if he reads this, thank you for your kind words. There's been a comment on RMWeb that the Klondyke wasn't seen enough, but we're at a (happy) stage now where we have so many locomotives that we try to spread the load around and make sure they are all used over the weekend, rather than only use a handful and replace them when they fail. Graeme will attest to the fact that we start them all facing one way, then put them back in the box facing the other so we know what has and hasn't run. There are a handful of exceptions - we only have one silver A4, one West Riding A4 and two Coronation ones, although all of those are replaced by other locos from time to time. in the main, though, we do try to mix it up. Graeme's Immingham often gets the KX-Leeds turn, the Mikados also often work a different Leeds express, we always put a C1 on the Scarborough Flyer (I think a C7 did have a crack on Sunday) and the Queen of Scots and all sorts gets to pull the Holgate ECS. As an aside, it's interesting to see the variety in performance of what are supposed to be identical locos made to the same design in (mainly) the same factory. 4472 will pull anything you put behind it, but some of the others - Papyrus and Bayardo come to mind from this weekend - struggle with the same sets. Yet they're all based on the same Hornby model. Looking at Malcolm's spotting list, we do have a B2 which only comes out at base - there is a chance we'll have one in the future as they did work in from Lincoln. A C4/5 is also a distinct possibility. D6 is less likely. There were two J3s available and at least one was used as you can see it shunting in the background on the video someone has posted (starts at 2:02). K2s are also common - I saw a couple come through my yard on goods workings, although they mainly work in and out of the north end. The P1 and Q1 (2 actually) work the same train, the coal empties, so probably only run once a day each as that goes round twice during the sequence, we get through the sequence more or less twice a day and I have a pool of 4 locos for it (O4, O2, P1, Q2). You can see them standing to the right of the rear turntable in Graeme's aerial shot (looking hard, the P1 is on the front road and I think the Q2 may be on the train, on the ramp in the corner to my right). Mr King's W1 was certainly used more than once, as was the 4-8-2. The Sentinel, the temporary Ruston-Hornsby shunter, is a Y3. It's the Model Rail one, for no better reason than it was the easiest to fit a kadee to. Kadees I have mixed feelings about, although less negatively than I did. I don't have to use them in public view, which certainly helps. What we have found is that the mount can be as much of an issue as the coupling itself - you can get them all to within tolerance on the height gauge, but under load the NEM pocket son the backs of locos or on Hornby bogies can flex up or down, allowing the coupling to detach. Almost all our Hornby tenders have a strip of 20 thou jammed into the pocket to stop the coupling drooping. I've almost converted all my carriages to have a 252 mounting box on the body and a self-centring coupling (14x), which seems to offer much less vertical movement. Wagons are being revised the same way. I was given some brass NEM pocket mounts before we went to Barrow Hill, but two of those failed over the weekend and i don't think they're reliable enough in the long term. The puzzle of the images that I thought I had posted, but hadn't, is a little deeper than the superficial evidence would suggest. I certainly did post them directly on the big, big, website but I also very distinctly recall pasting in the remote hosting image links in the way that is necessary for LNER-land. Perhaps through the fog of fatigue I just closed the draft post or moved on to another web page without hitting the "submit" button? Enemy territory? I didn't think so. 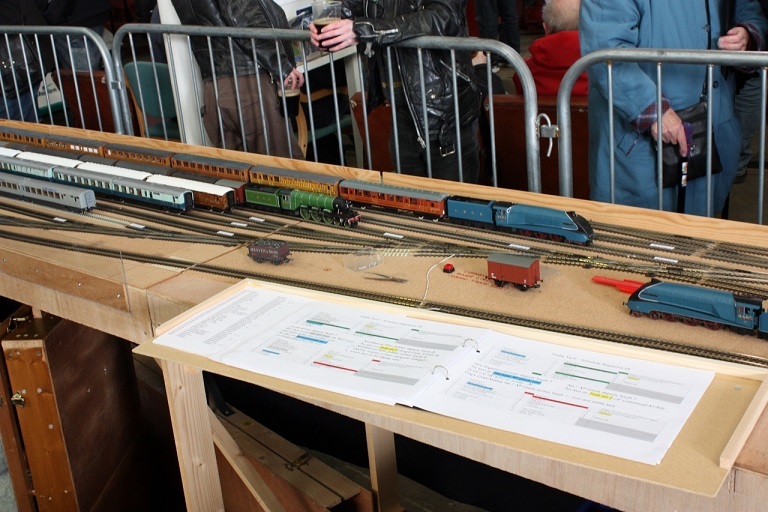 There were several LSWR layouts at the show. The letters on the tenders are similar to ours, at one time they used a vaguely similar shade of green, and the lining scheme wasn't too dissimilar either. The clincher was my parochial philosophy: Any enemy of the GWR stands a good chance of being a friend on mine. Sadly I couldn't stay all day seeing all the locos, as I'd like to have done, but my arthritic knees were becoming painful from all the standing still. I shall have get a shooting stick type of seat for future exhibitions if they are showing layouts like Grantham. Just a thought; the line from Grantham to Market Harborough was jointly owned by GNR and LNWR. Did LNWR locos ever work the services along the line? I am not offering to build LNWR locos as I don't like the LNWR, especially the wheels, and the locos all look aged. That's a topical question actually. I notice we have a Leicester train in the sequence. I've been meaning to ask our boss if that train works to/from Leicester Central via Nottingham, or uses the GN / LNW joint. ET, that goes over the head really, we do try to fly the Eastern flag in the Newhaven club but we do have some misbelievers. Having said that, with Borchester now in hibernation for a while I decided to look for a challenge, so have gone to a slightly wider gauge - EM and to model, gulp, a BR(W) branch line, trying to see if it is cost effective to try DCC, but my question on Kadees came from this, currently going down the s&w route but not sure. GK, I take it that a Hall to County front end resin conversion is out of the question? That aside, back to a real railway, as much as I would have liked to talk to the guys in the fyard there was a lot of concentrating going on there so best to leave alone, but was entertained by TW at the front trying to work out the shed switches. Is that some sort of timetable book you use in the fiddleyard, does it show the stock and formations for certain movements, colour coding? Taking a line from Frank Dyer and his Borchester loco articles, we have shown on the front of the layout like he did photos of the locos with relevant notes, it's useful information. There is a lot more locos running on Grantham than BM, but give it a thought. Charlie, I thought i saw you over the front, but next time I looked you'd gone. Depending on where we are in the sequence, it can get a bit intense round the back, but most people seem to appreciate that. Each page shows line occupation in north and south yards at start and end of the move, highlighting the trains which move and the text in the middle shows each operator in more detail what they have to do. The two yards work together most of the time - South Road 3 (between the A4 and the A1/3 above) can be controlled from either end and is used to hand trains over between yards, so a North End working like the High Dyke ironstone will move down to here and be despatched from South End, speeding things up and allowing North to do other things. South end can also drive trains to just behind the scenic section to the right and rear of this photo, which means they appear much more quickly when called on by the front operators. We have enhanced them since the above was taken at Barrow Hill, but they still work in the same way. Extra sheets are used when sets are remarshalled, but the books are the heart of the whole operation (and the carrier bag they travel in always one of the highlights of the weekend). I'm not sure where we'd put any more information at the front, but it's something we can look at once the scenery is nearer complete. Last edited by jwealleans on Fri Dec 21, 2018 7:37 am, edited 2 times in total. With regard to the comments re the LNWR and the Grantham-Leicester service. LNWR trains used the joint line through the Vale of Belvoir to access Nottingham and Yorkshire. Coal being the driving force. The GNR didn't get as much benefit from it. The LNWR had its own Goods Yard and Warehouse in Nottingham and their own Loco Depot and Sorting Sidings at Colwick. The closest LNWR locomotives would have normally got to Grantham would have been at Bottesford, (Leics). The Joint line passed under the Grantham-Nottingham line. As for the Grantham-Leicester service it ran direct via Melton Mowbray, (see the N gauge layout of Melton Mowbray North). Leicester Belgrave Road station was the ultimate destination, accessed from Marefield North Junction on the Joint Line. Curiously, in the early life of the Joint line, many passenger services changed / terminated at Harby and Stathern station. This required a turntable to be installed. I've never managed to discover the reason for this. One theory, is that the original intention was to have trains terminate / start at Melton, but there were several Hunting Lodges in the vicinity of the Joint Station. No doubt, visitors to the Duke of Rutland's hunting parties would have been less than impressed to see those foul engines standing around between duties, so close to their lodgings. I hope that has not bored you all too much. On the contrary, most informative. An entirely gratuitous 'plug' that Grantham will be at Warley this coming weekend. I'm sure most of you on here already were aware of that - and for those that weren't, it might be too late to make plans now anyway - but for what it's worth. Much midnight oil been burnt by various members of the team so I can by no means claim all recent improvements to be mine but the new signals are definitely one I've been working on. Do say hi if you are able to attract our attention. Looking forward to actually getting a chance to look at Grantham this time round! The first time I attended Warley, I completely missed it. Will defo keep an eye out this time!